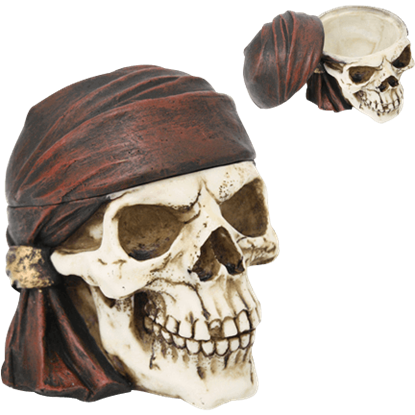 Skulls and skeletons are staples of all things gothic and dark, so our skeleton and skull trinket boxes are phenomenal ways to add a classic creepy vibe to your surroundings. 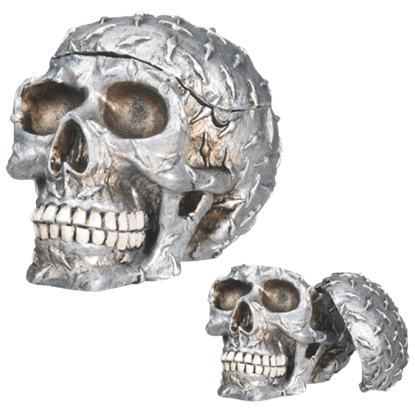 We offer a wide range of skull and skeleton boxes here, from skull head jewelry boxes with craniums that come off as lids to coffin trinket boxes shaped like their larger inspiration and decorated with bony remains. 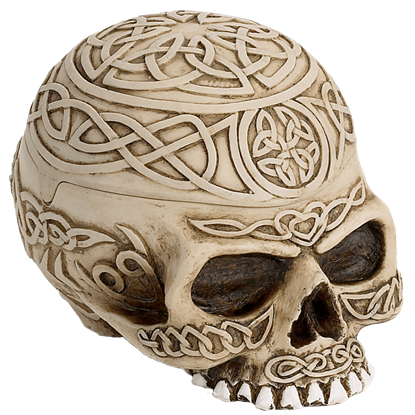 We have Celtic skull trinket boxes and Viking skull jewelry boxes as well as bronze tone steampunk skull trinket boxes and metallic skull jewelry boxes. Some of our mirrored trinket boxes feature the art of famous fantasy artists like Anne Stokes. Whether the coins, jewelry, or other small keepsakes you are storing are gothic in nature or not, these gothic trinket boxes are perfect for keeping them stylishly stored. 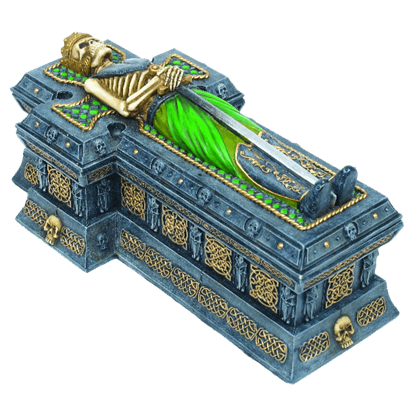 The Celtic King Box is a great place to keep your personables. This box would make quite a conversation piece as well. The cross-shaped coffin has stunning Celtic designs around it. There is the skeleton with his sword on the lid. What better place to store something than in an item so creepy and strange that no one will ever want to examine it! 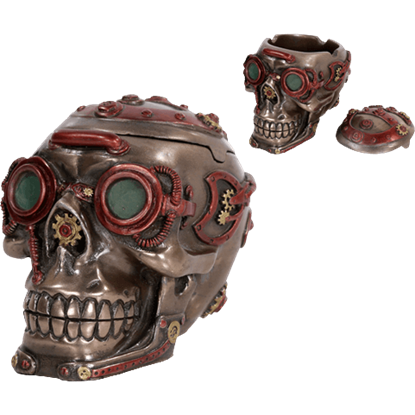 The Celtic Skull Box is a truly unique decoration that you can use to hide all your neat little valuables. 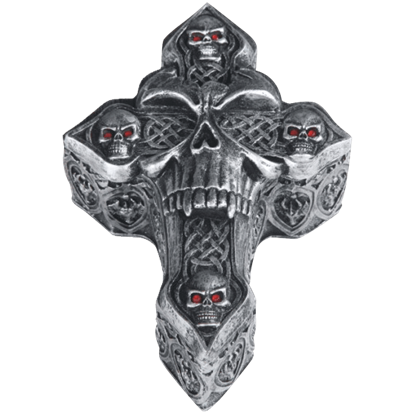 With the frightful look of a screaming skull embedded within its cross shape, the Celtic Skull Cross Trinket Box is a stunning example of gothic decor. Made of cold cast resin, this trinket box is hand painted for a metallic look. The Celts believed the most honorable deaths occurred in battle and offered the dead items needed for the next life. 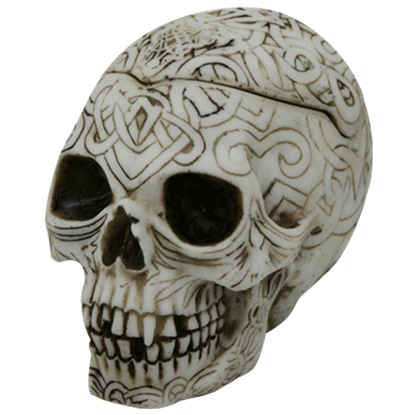 The Celtic Skull Trinket Box allows you to commemorate these warriors with a skull bearing Celtic knotwork. This Diamond Plate skull is a beautiful piece of art that is hand painted with great attention to detail. 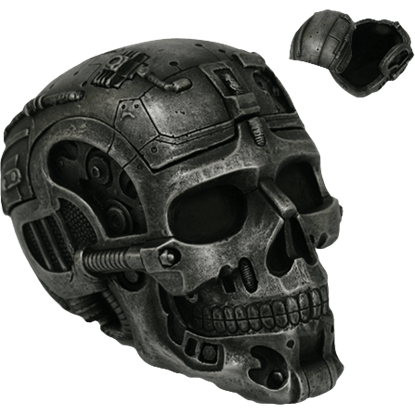 The top of the skull is a lid that comes off revealing a secret compartment. The Diamond Plate skull is 3.5 inches tall. 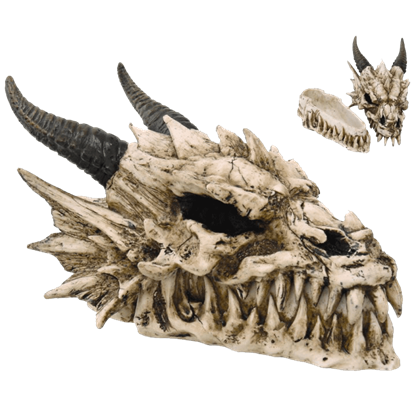 Keep your keys, coins, or jewelry in the Dragon Skull Box, ready to guard your treasures with its frightening skeletal visage. The remains of this ferocious dragon are as fearsome as the living beast must have been, if not more! 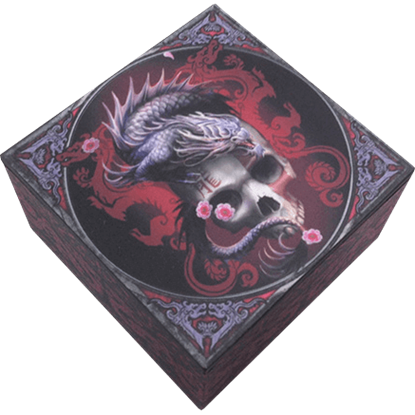 The art of Anne Stokes is always so unique and fascinating, and this Eastern Dragon Skull Mirrored Trinket Box is certainly no different. Great for storing small items, this box will also add an Oriental touch to your home design. The Salem Witch Trials culminated in the deaths of twenty people who were accused of witchcraft in colonial Massachusetts. 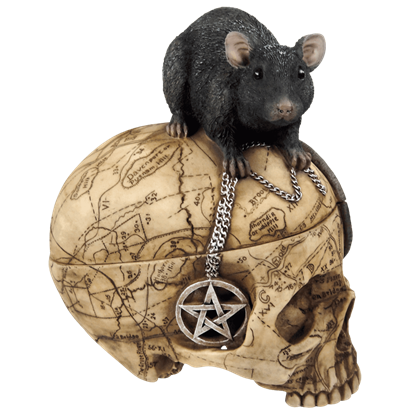 The Etched Salem Witch Skull and Mouse Box commemorates these deaths with a mouse holding a chain on a skull. 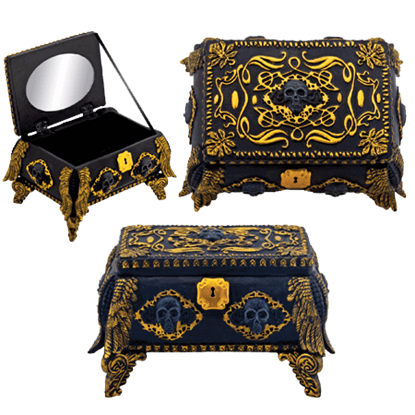 Bright golden colored filigree, flowers, and folded wings surround ominous black skulls on every side of the Gold and Black Ornate Skull Jewelry Box. This elegantly embellished jewelry box features a hinged lid and an inner mirror.